Happy summer! I am so excited to share several summer-themed projects that I've been working on this month! 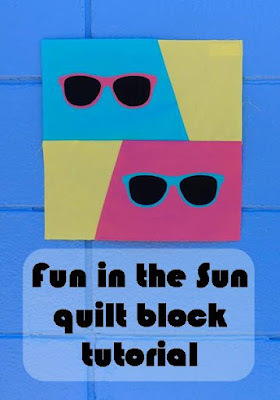 First up is my Fun in the Sun quilt block that I designed for the Summer Block Party - a Sew Much Fun blog hop hosted by Jen at Faith and Fabric. 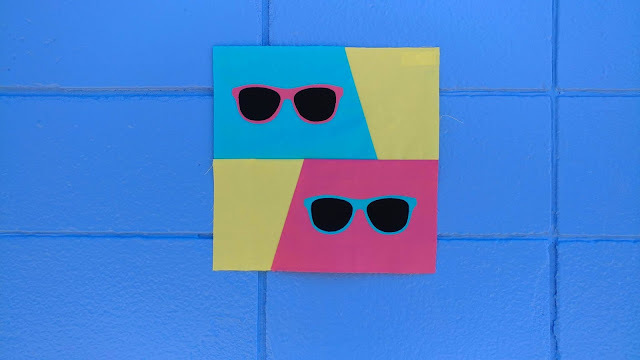 Fun in the Sun is a quick and easy quilt block that depicts a summer staple - sunglasses! Do you remember those plastic neon sunglasses of the 80s? I think I had every color as a kid! My solids version is made with Kona solids by Robert Kaufman. 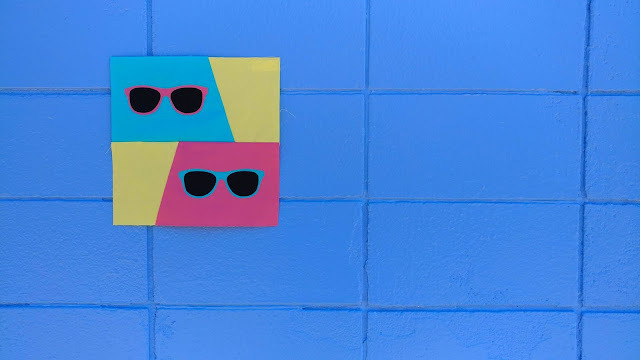 This blue, pink, and yellow combination seems perfectly 80s! The exact colors I used are Jamaica (491), Azalea (419), Highlight (the 2016 color of the year), and Black (1019). As soon as I designed the block, I immediately knew Kim Kight's new Snap to Grid fabric for Cotton + Steel would be the perfect fabric line to turn this block into a whole quilt! 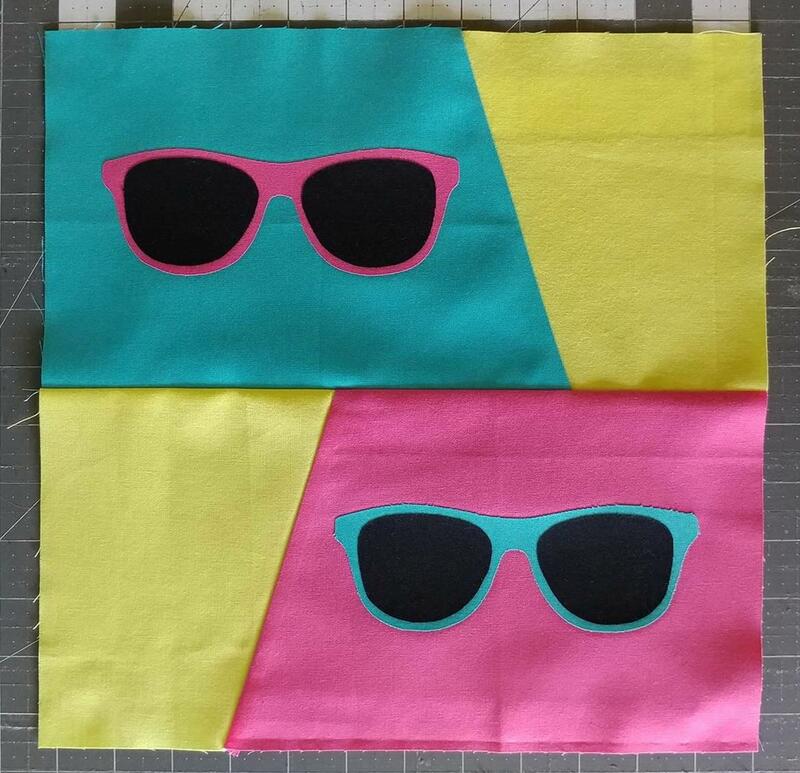 The fabric is inspired by all things 80s, so it's meant to be! Kerry (who blogs over at Kid Giddy) sent me a few scraps of the fabric so I could test out the idea. 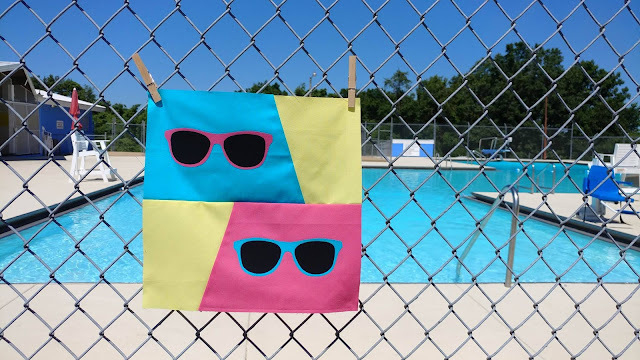 Be sure to check out the other summer blocks on the Sew Much Fun blog hop too! 1. Iron sunglasses frames and lenses fabrics to fusible web following manufacturer's instructions. 2. 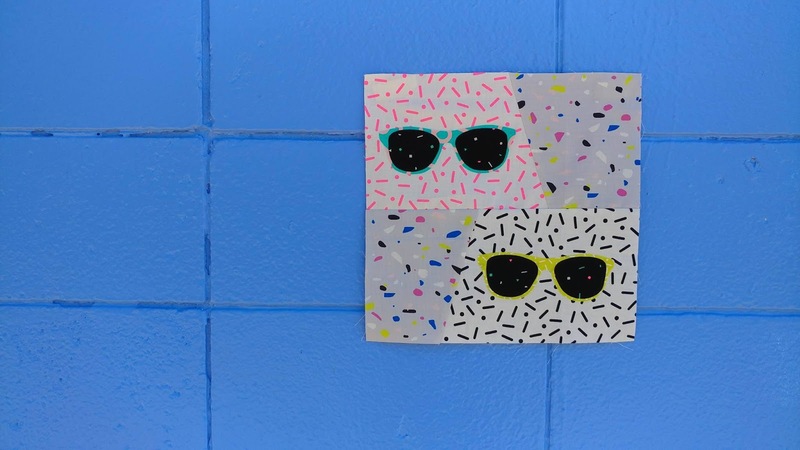 Print sunglasses clip art so frames are 6 1/4" wide. I used the one here. Cut out. 3. 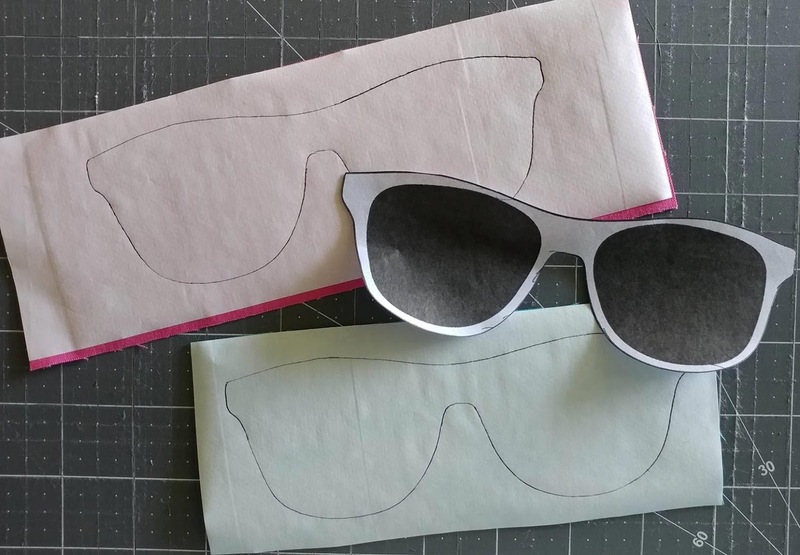 Trace sunglasses onto the back of the two sunglasses fabrics (I just used a pen on the paper of the fusible web). Cut out. 4. 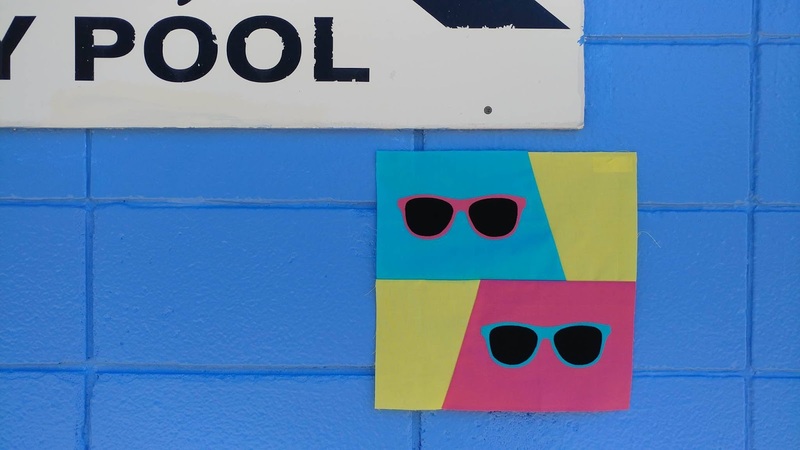 Use scissors to cut out the clip art sunglasses lenses. 5. Trace two right lenses and two left lenses onto the back of the sunglass lens fabric pieces. Cut out. 6. Lay one background 6 1/2" x 9 1/2" rectangle on a cutting mat. 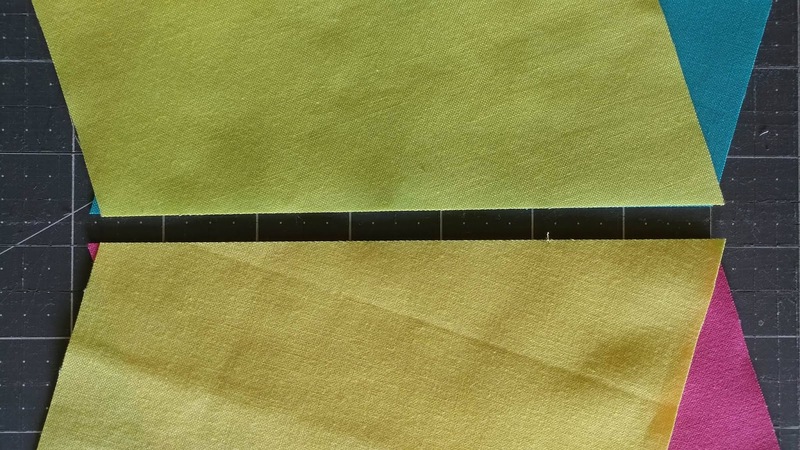 Using the grid on the cutting mat, align an acrylic ruler with the bottom right corner and angle the ruler so that the ruler is 2" inside the top right corner. Cut. 7. Lay one 6 1/2" x 5 1/2" background rectangle on the cutting mat. 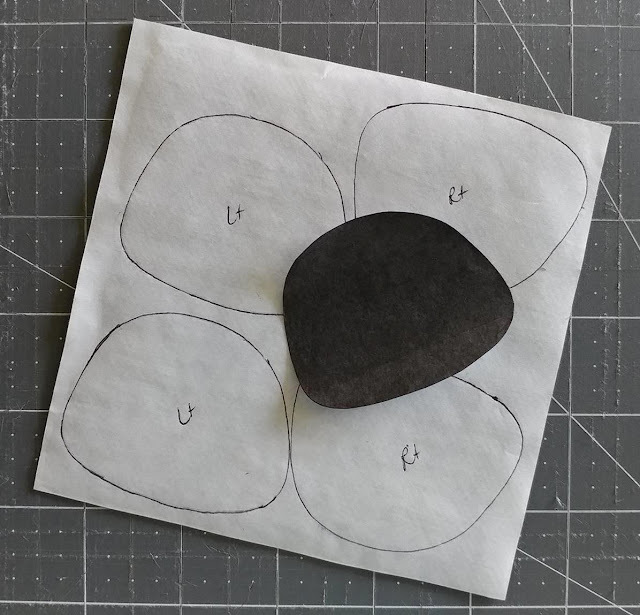 Use the grid on the cutting mat and align an acrylic ruler with the top left corner and angle the ruler so that the ruler is 2" inside the bottom left corner. Cut. 8. Lay the other background 6 1/2" x 9 1/2" rectangle on the cutting mat. Use the grid on the cutting mat and align an acrylic ruler with the bottom left corner and angle the ruler so that the ruler is 2" inside the top left corner. Cut. 9. Lay the other 6 1/2" x 5 1/2" background rectangle on the cutting mat. 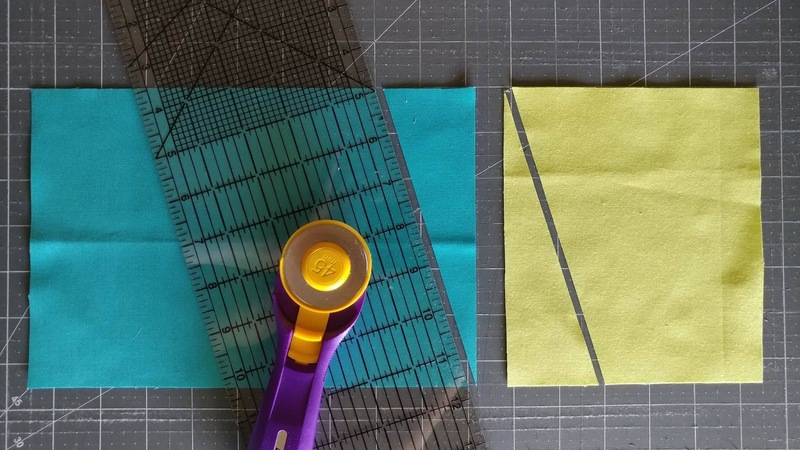 Use the grid on the cutting mat and align an acrylic ruler with the top right corner and angle the ruler so that the ruler is 2" inside the bottom right corner. Cut. 10. 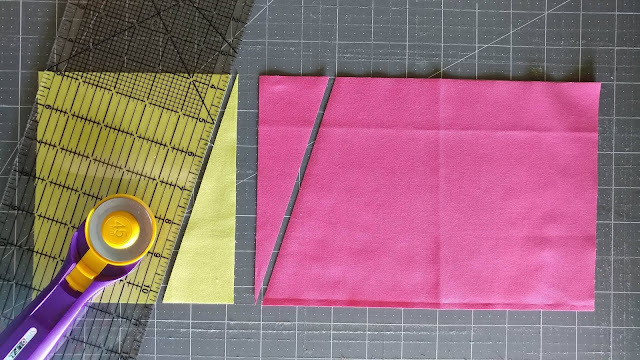 Sew the two background pieces created in steps 6 and 7 together along the angled edge. Offset the ends just slightly so that the edges are lined up where your needle will stitch (don't align the corners). 11. 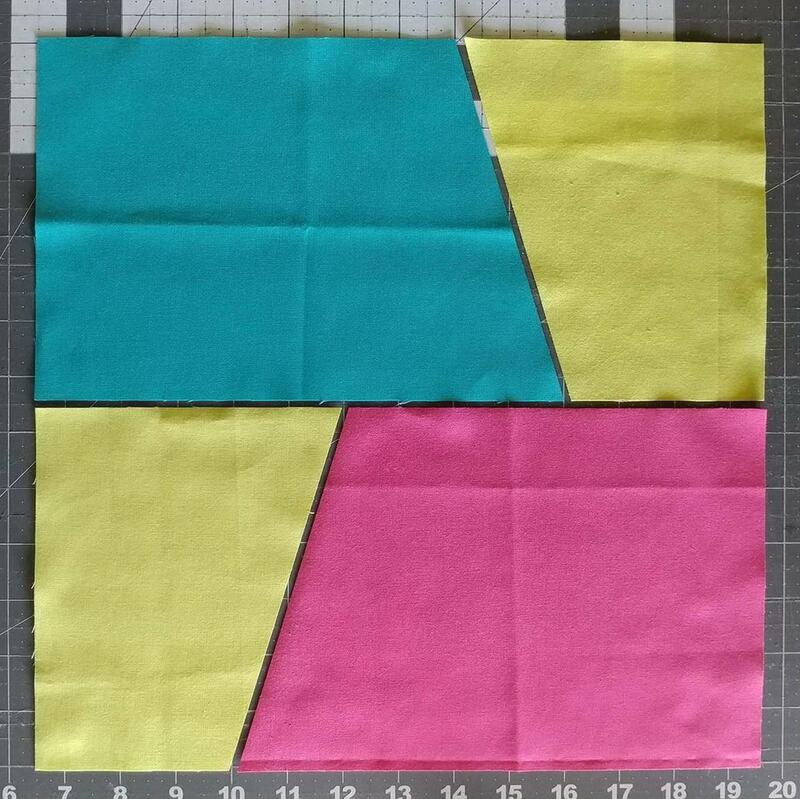 Sew the two background pieces created in steps 8 and 9 together along the angled edge the same way as in step 10. 12. 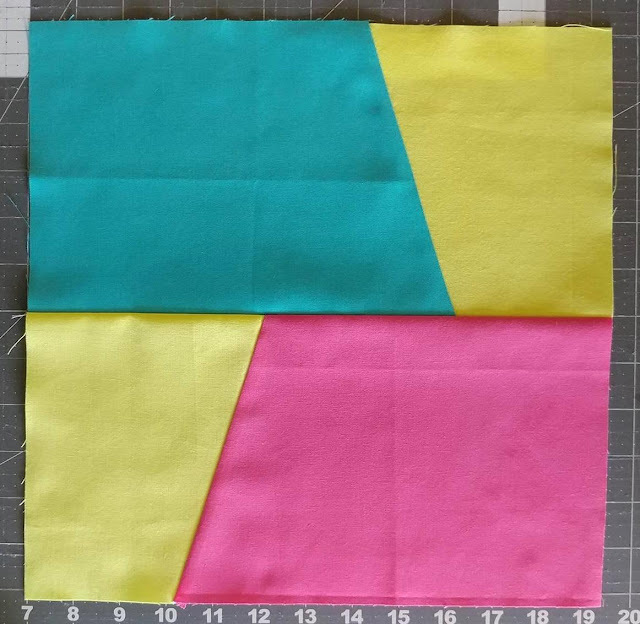 Sew the two background pieces created in steps 10 and 11 together along one long edge to create a 12 1/2" square block. 13. Position the sunglasses frames on the background fabric so that they are 2" from the center horizontal seam and about 1/2" from the angled seam. Iron in place according to the fusible web manufacturer's instructions. 14. Position the sunglasses lens onto the frames and iron. 16. Create multiple blocks or combine this block with others to create a fun summer quilt! Please let me know if you make a Fun in the Sun block! I'd love to see what you create! Linking up with Tips and Tutorials Tuesday at Quilting JetGirl and Let's Bee Social at Sew Fresh Quilts. Awesome. I believe that this will work great and we will be able to have some fun using our creativity. Cute and simple!! This would make a great panel on beach bag. Cute block! I agree this would look great as a beach bag, but also just a fun summer quilt! This is a really cute, fun, fast and versatile block. How cute is this block! This block is "too cool"! I love the retro colors in the solid block. Thank you so much for linking up with Tips and Tutorials Tuesday! Laura your block is so cute and love your photo shoot!